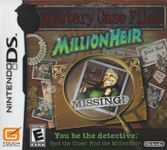 Mystery Case Files: MillionHeir is a puzzle adventure video game developed by Big Fish Games and Griptonite Games and published by Nintendo, for the Nintendo DS handheld video game console. It was first released in North America, was later released in Australia, and then Europe. It is the second Mystery Case Files game to be made for a portable device. Although the game is part of the Mystery Case Files brand, it is not a part of the main computer game series. Phil T. Rich, millionaire has been stolen by an unsuspected criminal and it's your job to figure out who is the culprit. In this ten chapter investigation find out who has kidnapped Phil or potentially killed him. Use you skills with the Crime Computer and other gadgets as underwater goggles and x-ray vision. And on your way complete puzzling challenges and mini-games. As you investigate through 12 suspect you'll get closer to solving the mystery of Phil T. Rich. Source: Wikipedia, "MillionHeir", available under the CC-BY-SA License.